Saying that the pre orders of the PS4 are selling like mad would be an understatement. After the first day of E3, Sony’s pre-orders were booming, the PS4 was the hot new console to get. Well, that is until Microsoft pulled the plug on the DRM and other issues that plagued the Xbox One. The PS4 is still the console of choice for many gamers and consumers this holiday season, but some things are kind of holding me back from buying it day one. I am not fully on board with having to have PS+ to play games with online multiplayer features in games like Destiny. However, with the price being only $5 per month, along with the perks that come with PS+, I think it’s a necessary evil (unless they make certain games’ online features playable for people who have either membership for the PS4). Even though I do like what the console features, I have not been fully persuaded to pay $400+ for the PS4 and games, at least not yet. I do like some of the titles announced for it; the games that caught my attention were The Order: 1886, from the God of War developers, the downloadable title Secret Ponchos, and the focus of today’s Thoughts On, Knack. I might not get a PS4 day one, but Knack and those other games I listed sound like a good reason for me to get one. Even future titles like Destiny look interesting to me. However, Knack, for the most part, was the first game for the PS4 that caught my attention when Sony started to talk about it earlier this year, and after doing some research and looking at the videos for it, it looks promising! Not only is it being developed by Sony’s Japan Studio, the same studio that is also making the downloadable game Rain and the 2.5D platformer Puppeteer, but it is also being designed by Mark Cerny. For those not in the know, he is to game design what Jim Cummings is to voice acting; he has been on everything! He has worked on the PS1 Crash Bandicoot and Spyro games, Ratchet and Clank, and Resistance. You get the idea. He has had a hand in a lot of great games and still does. 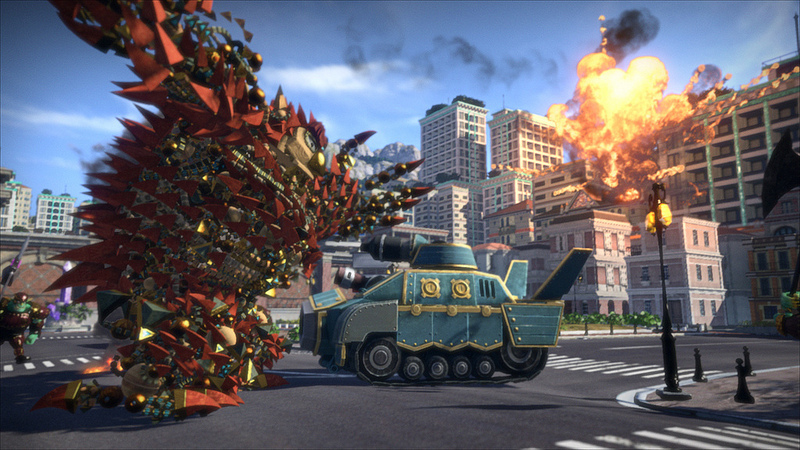 So, let’s begin with his most recent work, Knack. The story, for the most part, seems simple enough to follow. An evil race of beings known as Goblins are attacking human kind, and of course the humans are fighting back. A young human scientist comes up with a new way to fight back against the Goblin forces. What is this new weapon to fight the Goblins? A small, living being made of relics known as Knack. He has the ability to absorb ancient relics and become more powerful. It is up to Knack and his creators to fight off the Goblin forces and save the day. From what I have seen, the story seems simple and easy to follow. It has a lot of themes that I have seen in stories like this, and hopefully the characters are likable enough to be invested in. Then again, we are dealing with Cerny who helped make platformers with likable and entertaining characters. We will only know for sure when the final product hits the public later this year. The gameplay has been described as a mix of Crash Bandicoot, God of War, and Katamari Damacy. I can say after watching the demo that, yeah, I agree. It is a mix of those games, but that is no surprise since Cerny did work on God of War 3 and the PS1 Crash Bandicoot games. You play as the title character, Knack, going through linear Crash Bandicoot-style levels beating down on Goblins and other enemies to get to the end of the level. From what I have seen, Knack’s main ability is that his body can absorb sun stones and relics to become more powerful and gain more health. You lose health and power if you lose too many pieces from your body, and gain new attacks and abilities as you play through the game and get stronger. You can also find pieces of machinery to make new machines to make the experience easier, like being able to gain more relics and etc. Along with the relics, Knack is able to absorb different parts of the elements. 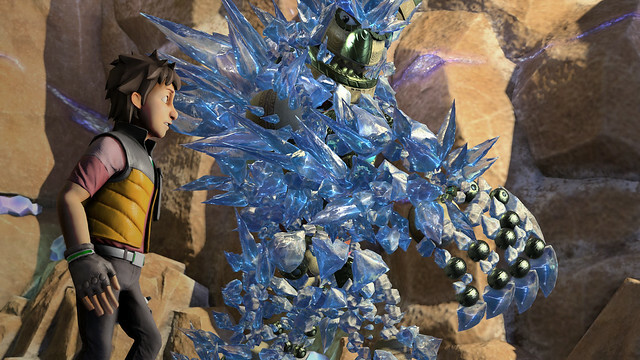 In the E3 demo, Knack was covered in ice, which may or may not give him special abilities. I like the idea of the overall gameplay design where Knack will get weaker, both health-wise and strength-wise, if he keeps getting hit. It reminds me of how in Dragon’s Dogma you can lose parts of your health bar when you get struck, but can’t fully heal yourself unless you go to a resting area of sorts. It gives the game some depth because you don’t just want to rush through the fights, or else you will find yourself with less health and strength to take on the enemies. Graphically, it looks great. I like the soft textures on everything, giving it a good cartoony feel to the overall presentation. I also like the little bits of detail added like when Knack gets hit, he loses bits of relics from his body. It’s just little details like that which makes me feel for Knack and make him more than just a walking weapon. As opposed to other Playstation games like ICO, I don’t think this game will have the emotional impact of a deep relationship between the scientists and Knack, but I’ve been wrong before in my own personal experiences of how certain game’s stories have turned out. The music sounds pretty good. It sounds like it’s going to be grand in scope, but we will have to see if the music is more than epic 24-7. Then again, if you are going around destroying goblins, smashing stuff, and turning into a 3-story-tall beast, you really don’t want some kind of music from “My Little Pony” or something in the background. It looks like a solid package with good graphics, sound, and voice work. If I were going to get a PS4 day one, I would be thinking about getting Knack. Since, well, when isn’t it a good idea to have a platformer for your new console? It looks like Sony is doing the right thing by offering a multitude of games ready for their new console at launch, and Knack is looking to be one of the best reasons to get it. Good looking graphics, fun gameplay, and led by one of the most well-known game designers on earth, Knack is looking to have a knack for being many people’s first PS4 game.